This script is no longer necessary; please visit Announcement: Keyboard shortcuts are now integrated into the site for an updated status on this. This is the official keyboard shortcuts script for the Stack Exchange sites, as announced on Meta Stack Overflow. It is still in active development, and will eventually move from being a user script to being a full-blown (optional) feature when it is ready for that. version with update check – regularly checks for an updated version of this script and notifies you if one is available. Requires localStorage. After installing (and possibly restarting/refreshing), pressing ? should get you started. Should work in Chrome, Firefox (with Greasemonkey) and Opera (where you'll have to manually move it to your user script folder). May also work in other browsers; see the tag wiki of the script tag. Feedback is very encouraged – keyboard shortcuts are a power user feature, so we have to know what those power users actually need. Please leave or vote on feedback on the Meta question. Fantastic addition to the site, hands down. I just browsed for half an hour with nothing but the keyboard. The only suggestion I would have is adding a shortcut for jumping out of the answer/comment textbox without having to tab over to the "post" button. Can be kind of annoying when I accidentally hit "enter". I love keyboard navigation, +1 to infinity for this feature! I have but one request: I usually open up questions in a new tab, from the newest or active questions pages, for example. Normally, on Mac, I'd hold down the ⌘ (command) key while clicking on the link, or use the TAB key to shift focus to the link and use ⌘-ENTER to open the link in a new tab. However, with the keyboard extensions, when a question has been selected (after pressing U, first question for example), there is no link focussed and the ⌘-ENTER will not open the question, at all. Could this be implemented in the keyboard extensions? This probably has to be platform dependant, as the modifier key for Windows and Linux would be different. Using Shift-ENTER opens questions in a new tab. However, the same does not apply to the other options. Could this be extended to any of the options that load a new page? So, hit i for inbox, then Shift-1 to open the first inbox message in a new tab. Preferably, I'd still like to see this using the native 'open in new tab' modifier key (CMD on Mac for example), instead of using Shift. 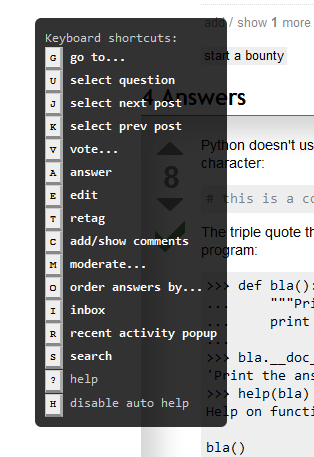 After loading newly-posted answers with F they are not navigable with the J and K keys. Only items already loaded with the page are keyboard-navigable. When you are viewing a question list that updates via the live question bar ("N question(s) with new activity") and you use the mouse to click and load the new question(s), then the JS model as seen by the keyboard shortcut code is not updated. As a result, the newly loaded questions cannot be navigated over. Thus, U goes to the question that was top-most before you clicked on the new questions link, and K will not move the question indicator any higher. 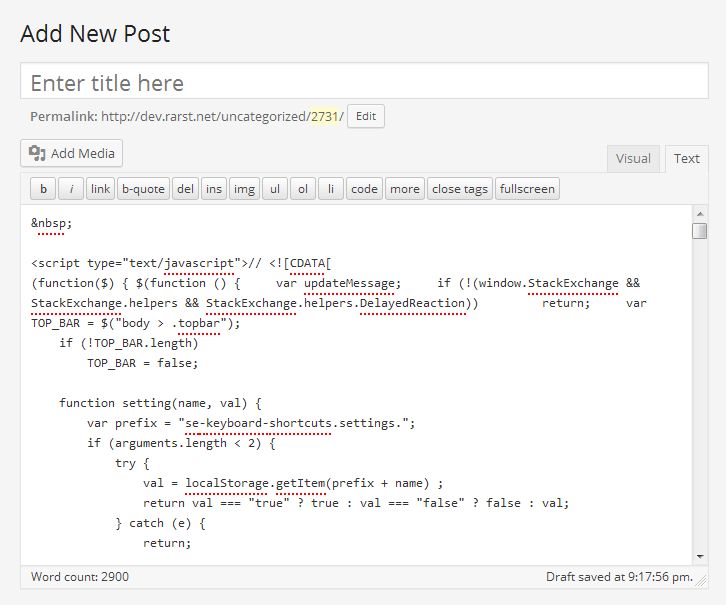 I have peculiar issue with script somehow inserting itself into editors on completely unrelated sites. It seems to especially love to wreck WordPress and Basecamp posts. Please add a consistent shortcut to reach the (new) review queues. With consistent I mean one that is there on all sites. Currently, I can go to the review page on Programmers.SE and here on StackApps, where I can type GSR for go to... -> special pages... - review. But the same option isn't available on MSO or on SO. On SO, the special pages... listing gives me the option to go to suggested edits and flags, MSO has no special pages... option at all. Either my reputation level prevents me from seeing the review option on those sites, or they have been configured differently to alter the keyboard shortcut script's behaviour. Can I get a way to configure which keys do what? I like to have all the most commonly used keys clustered in one place: it's hard to use SO with a drink in my hand if I have to use both hands to do anything. With the new comment format rolled out, comment loading is now broken. C no longer triggers comment loading. This looks like a conflict with AutoReviewComments - Pro-forma comments for SE, disabling the extension brings back the functionality. Not the answer you're looking for? Browse other questions tagged script keyboard-shortcuts .